This is the second-most read book in our house, right behind Going on a Bear Hunt. I am not sure why, but I cannot count the number of times I have read it to my kids in the last year. Fancy Nancy and her little sister JoJo are getting a surprise brunch, as well as cards and flowers, ready for their mom on Mother's Day. Everything is spiffed up in typical Fancy Nancy style. Daddy does his part too, making waffles! Sometimes Nancy is a little whiny and pretentious, but not in this book. In this book she is whimsical and generous. I love that her gifts are fancy, but homemade and with heart. I'm sure you all know that I bought this book to brainwash my kids into giving me what I want for mother's day- a lie-in, meals made for me, and homemade cards. This is not really Japanese style, so I am passing it off as Canadian cultural study rather than just selfishness. This book has all the good Fancy Nancy parts- organic vocabulary lessons as Nancy shows off her big words, a close relationship between siblings, and glitter. It's also a lift-the-flap book which fascinates my kids still. The look inside the refrigerator is very cool too, it's so different than ours. My son has often asked where Nancy's family keeps their miso, inside the fridge or cupboard? Ha! 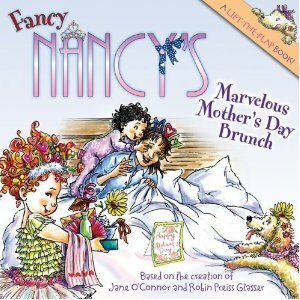 This is a great Mother's Day book, and also a great book for everyday, as it is one of the best Fancy Nancy books there is. With my tow oldest being boys I was WAY LATE getting onto the Fancy Nancy train- then after finally getting the original book a few months ago I felt ridiculous that it had taken me so long... Fancy Nancy is wonderful (and my boys love her too) I haven't read this one, but I will put it on my list now. Awwwwwwwwwww me want. So cute. I've been ooohing and ahhhing FN for ages. I'm so glad I have a little girl now to give me an excuse to start buying her books. Have you seen her little detective story?